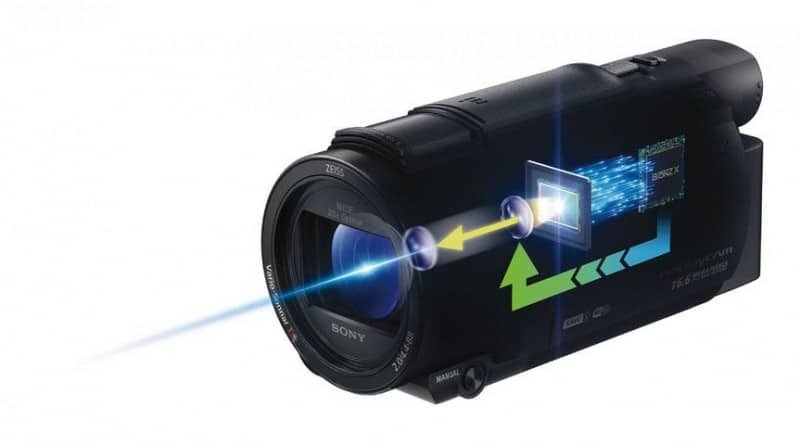 Sony launched the successor of the AX33 with the latest addition to its 4K video camera line, the Sony AX53 4K Handycam. It boasts of a 4K Ultra HD 24/30p & 16.6MP stills. Also, it has a new Zeiss lens, along with two additional features; 20x optical zoom and microphone. The camcorder is equipped with tiltable 3.0” LCD Touchscreen and 0.24” Color EVF as well as capable of high speed recording at 120fps. This top of the line 4K handycam also has enhanced image stabilization with the featured Balanced Optical SteadyShot. Additionally, the Fast Intelligent AF offers faster focusing and the new microphone can capture sounds from different locations. This camcorder also has automatic image as well as audio settings that makes it perfect for manageable point-and-shoot options, not to forget its improved manual controls. With its features, the Sony AX53 4K Handycam offers endless possibilities. The body of the Sony AX53 is similar to the design of its predecessor, the AX33 but with enhanced features and better performance. The Zeiss Vario Sonnar lens was redesigned with the widest angle of 26.8mm for a 20x optical zoom, much better than the lens of AX33. For a closer shot of the subject, the lens can be extended up to 30x/40x in 4K HD with the use of Clear Image zoom feature. As for pixel size, this new camera is 1.6 times more than the model before it. With advanced image stabilization technology, recording footages is more stable since it controls camera shake. Balanced Optical SteadyShot Image Stabilization also works well in all zoom ranges, even while shooting in HD mode. The camera’s 5-axis Intelligent Active mode makes it possible to capture videos and creating high-quality movies even if the user is mobile. The Intelligent Auto mode also make is possible for the camera to analyze the shot and pick the right settings from a number of scene modes. These include Spotlight, Twilight, Baby, Tripod and Landscape, among others. For precise contrast-detection autofocus that has 40% more speed, the Fast Intelligent AF reduces lens motion and at the same time accelerate lens drive. This is great for fast moving subjects. It is also possible to record two videos simultaneously with one recorded in the maximum-quality AVCHD or XAVCS format while the second one using MP4 format. This feature is great for having two files for professional applications and instant sharing. For stills, sequential images can be captured at intervals that can be set and editing of the sequence shots for post-production as well as play back can be done seamlessly with the 4K Time Lapse feature. Meanwhile, user can take advantage of the 5.1 channel built-in microphone that can capture sounds from five different directions while recording in AVCHD mode. And to keep track of the channels’ levels, there is an LCD panel on the camera. Display is an LCD Touchscreen with a size of 3 inches and sports 921K dot resolution that results to clear, bright images in which settings can be altered. Another interesting feature is the use of WhiteMagic technology that can increase visibility even in broad daylight that can be too bright. As for the 0.24” OLED EVF, there is a 1,555K-dot resolution that is ideal for color reproduction. This is because the camera uses four dual-surface spherical lenses which also gives a 33-degree viewing angle. For remotely controlling the Sony AX53 4K Handycam via an iPhone or any smart device, this model has a built-in WiFi/NFC connectivity. Live streaming is also possible with Ustream live streaming where you can share videos as you record them. To share and create short movies, there is the Highlight Movie maker feature in which the camera chooses the best scenes in your video in an MP4 format. 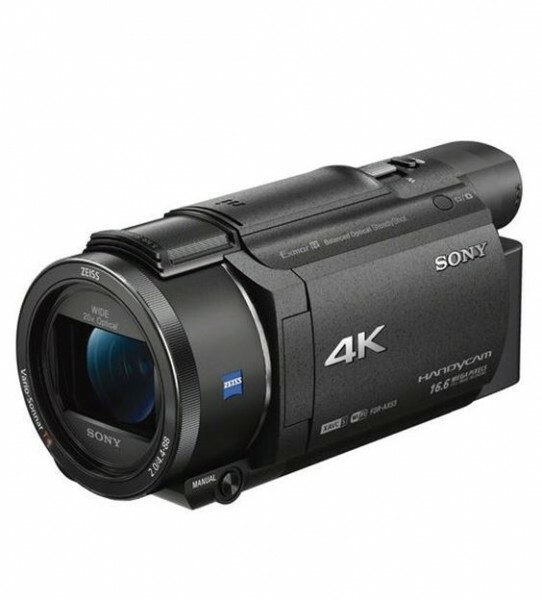 The Sony AX53 4K Handycam can take pictures and record videos in high quality despite shooting in low light conditions. Its image stabilization feature is also great even for capturing videos continuously over a long period of time. Recording in XAVCS is also flawless as it records clearly even subject is moving endlessly. Although it is lighter than its predecessor, there were no changes in the body design which can be a bit disappointing if the user is expecting a new look instead of the same body design the AX33 has. Price is also a tad high and when zooming too close, video recording can be jumpy. The Sony AX53 is better in features and performance than its predecessor, the AX33. It also is lighter, making it more portable. Users can also find the camera’s manual and automated modes. Overall, the AX53 is a versatile, flexible handycam that can be used for both amateur and professional applications.